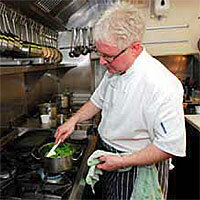 Bryan Webb is Chef / Proprietor at Tyddyn Llan near Corwen. Your cooking style in a word (or two) : Simple, seasonal, tasty. Biggest influence : Simon Hopkinson (former Bibendum chef). Favourite local produce : The lambs that graze in the fields around my home. Favourite dish : Sea bass with laverbread when I’m cooking. Gordon Ramsey or Jamie Oliver? Ramsey when he cooked in the 1990s. I’m lucky enough to have cooked for my greatest hero, DJ Johnnie Walker, on my 50th, so it’s mission accomplished.